Project Pengyou is working with a passionate and talented group of alumni of China study and exchange programs to launch a robust grassroots network of community chapters across the nation. 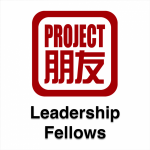 Pengyou Leadership Fellows will participate in a four-day Leadership Training Summit in October of 2014 at Harvard University, serving as the launchpad for a groundbreaking nationwide campaign to promote Mandarin study and constructive exchanges with China. The United States and China hold the world’s most important bilateral relationship, but the relationship is increasingly complex, challenging and multifaceted. With a population that makes up one-fifth of humanity, China is now an influential geopolitical power, the world’s second-largest economy and America’s fastest-growing trade partner. Currently there are twelve times more Chinese who study in America than there are Americans studying in China. In many regions across the United States, Mandarin study and study abroad opportunities to China are scarce, especially in some cities in the South and Midwest. Americans from those regions who take the leap to live in China often come home to find fragmented support and limited ways to continue meaningful engagement with China or China study. Project Pengyou is the first global community that seeks to serve, connect and build a robust national network of China alumni once they return to the U.S. We believe young Americans with frontline experiences in China are our most crucial and valuable asset in managing the future of US-China ties. In 2014, we seek to train and build a national network of community chapters for bilingual, bi-cultural leaders and bridge-builders through a number of high impact leadership workshops, thus forming the backbone of the Project Pengyou community. By training and engaging next generation leaders, Project Pengyou seeks to strengthen the capacity of Americans to not only benefit from the extraordinary economic growth of China, but to also ensure a functional, mutually beneficial and peaceful future for the United States and China. We believe the United States and China hold the world’s most important bilateral relationship, but the relationship is highly complex, challenging & multi-faceted. We believe US-China relations carry tremendous economic value & global importance. We believe people with frontline experiences in China are our most crucial and valuable asset in managing US-China ties. We believe all American “China Alumni” can – and should – play a major role in pioneering a robust & mutually beneficial relationship between our two nations.